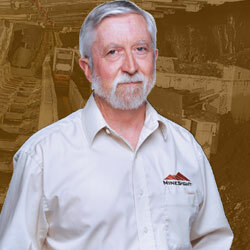 Starting his career as a geophysicist, it did not take long for John Davies, the President of MineSight to find his real passion—shaping, designing and scheduling the mine. Extremely inquisitive and determined at heart, Davies combined this passion with his interest in computer applications to write basic plotting applications in mining. This, he says, eventually led him to steer one of the finest software and services provider in the mining industry—MineSight. Established in 1970, MineSight, today has grown into a global network of mining professionals that provide technology support and services to the most complex mining operations worldwide. “MineSight is a product that I describe with five active verbs—explore, model, design, schedule, and operate. We’re involved in every aspect of deciding what the mine looks like in terms of the geological model,” says Davis. Started in 1970, the company, formerly known as Mintec, offers coal-specific modeling features and selective mining options for reporting. According to Davis, MineSight software is created by their mining professionals—delivered either short or long term, to benefit the life of the mine. For instance, the software tells the operator when to extract the ore, and what period of time. The software tackles all geo-modeling mining applications, improving productivity at every stage of a mine’s life by offering complete functionality for building and managing 3D block and surface models. It is used for exploration phase of mine development, through geological interpretation, feasibility, mine planning, and daily mine operations management. MineSight handles both metallurgical and thermal coal deposits, including multiple coal types. The process is performed in multiple range and operational details with regard to moving material. Responding to consistency, versatility and speed, the company offers packages for each mining area by optimizing resources and talent to maximize efficiency and productivity, along every step. make drift and stope design simple to perform. In terms of flexibility, Davies ensures that clients are provided with all the information required in a succinct package. “Collaboration and innovation is at the heart of MineSight,” affirms Davies. Though data management, data security and workflows along with intricate technical tasks weave a well-defined mining arena, a gap between planning and operations pervades the industry with ad-hoc processes and spreadsheets. MineSight’s set of distinct packages for each mining area bridge this gap by removing the risks and empowering miners to optimize resources and talents. This includes Exploration, Geology, Survey, Long Term Planning for Open Pit (LTP OP), Long Term Planning for Underground and Short Term Planning for Open Pit (STP OP). Davies’ sheds light on MineSight Exploration, the first package that includes tools for basic interpretation of geological data in plan and section. At the core of MineSight Exploration package is MineSight Torque. It stores, manipulates, and manages unlimited amounts of drillhole, blasthole, and other sample data in a Microsoft SQL Server database. Adding to the basic tools is the MineSight Geology package that arms geologists with CAD tools for extended interpretation assistance, geologic face mapping, drillhole and model coding. “The package consists of the Microsoft SQL-based MineSight Torque for drillhole management, along with MineSight Data Analyst that handles geostatistical analysis,” he adds. MineSight also provides sophisticated surface intersection and volumetric tools through the package— MineSight Survey—recommended for open pit survey management and volume calculations. MineSight Survey excludes functionality with multiple direct import wizards. The third package LTP OP Engineering helps in optimizing pit design quickly by evaluating mineral deposits in light of commodity prices and costs. Additionally, the process of visualizing development activities is simplified using the Long term Underground Engineering, which also includes MineSight Stope—a complete toolkit for stope scheduling and reporting. It enhances MineSight’s underground engineering tools; generating stope boundaries that can be quickly scheduled. The stope, calculates economic value of each block, simplifies management of economics by level, and has user input economics for block value calculations. “It determines economic boundary using Maximum Values Neighborhood (MVN), block-in and block-out method. “Besides providing a rich set of reporting methods, we also leverage an STP OP Engineering package that creates a short to medium-scale schedule using bench-mining cuts or solids to meet processing, plant bending and throughput needs. For Scheduling, one can use a 3D block model, stratigraphic model, or drillhole database while storing the information in a Microsoft SQL database,” extols Davies. Apart from information storage, making the layout of mine and designing including intersect shafts, cross-cuts, ore passes and haulageways is Underground engineering. This package includes MineSight’s 3D CAD, solids, modeling and solids intersection tools that also handle stopes, rooms and pillars. Pivotal to drillhole management, design functionality, statistics, modeling, and scheduling applications is our interactive Planner which creates mining cuts, while seamlessly reporting and plotting scheduled areas,” notes Davies. The underground basic package allows drillhole data to be imported using MineSight torque. “This package enables users to design drill holes, create sections and solids in 2D and 3D, code the drillholes models, undertake geologic face mapping, and create a model using the Inverse Distance Weighting and nearest neighbor interpolation techniques,” narrates Davies. He reckons that the MineSight Open Pit package includes tools ranging from geology, surveying, and engineering design to enable interactive short-term planning. The package features CAD tools for extended interpretation assistance, geologic face mapping and model coding. The tools not only update mine topography during actual mining, but also digitize mining cuts with instant reserve calculations, and cumulative reserves for the planning period. With regard to Stratigraphic, the package utilizes a host of powerful software tools for creating, manipulating and maintaining core site data sets, to ensure efficient site optimization. MineSight’s software package can model unlimited seams in one project. With greater spatial precision, sub-blocking enhances MineSight’s underground solution and makes modeling even the narrowest coal seam both quick and simple. The company supports multiple types of block models with several ore percent for unequalled accuracy in complex geology, gridded seam models for stratiform deposits, and sub-blocked models for spatial precision. Davies’ zeal and commitment fortifies that MineSight’s cutting-edge solutions offer numerous advantages for mining coal, particularly for structurally complex coal. For instance, MineSight Reserve, which unifies the consolidated power of MineSight’s reserve engines, provides complex coal functionality and comprehensive reporting logic. “Recent improvements to the MineSight Implicit Modeler offer true thickness calculations with surface outputs, plus user-input controlling features,” he adds. There is new multiple ore percent support in MineSight Data Analyst as well as enhancements in MineSight Torque that improve complex coal modeling. “Support is in our DNA and it distinguishes us from our competitors,” expounds Davies. He further elucidates that any customer-related issues in MineSight are dealt with in minutes, with meaningful assistance dispatched promptly via email. “As we expanded, our goal was to assure the support to each client, no matter where they are. If we could not, we would not sell the software,” adds Fred Banfield, Founder and Chairman, MineSight. MineSight is a comprehensive modeling and mine planning platform, delivering integrated solutions for exploration, modeling, design, scheduling, and operation.